something happens to make me worry that I missed something really big in my education. That happened again earlier this week. It shot a cold, sharp spike down my spine. It started innocently enough with a radio story on NPR about children’s toys, and how adults are continually increasing the amount of structured-by-adults playtime. I was just driving to work, listening to the story and enjoying myself. That was all fine. But then the interviewer starting talking with social psychologists about “executive functions” and “self regulation” and how well-known tests could measure the efficacy of task and attention management in schoolroom settings. I understood the terms well enough, but as the learned experts kept talking, I realized that I didn’t know this area of psych very well at all. Had it changed all that much since I studied it? It was abundantly clear that there was an established set of knowledge about how people manage themselves, their tasks and their focus of attention… and I didn’t know all that much about their world views on this. I suddenly felt a bit like a New Guinea highlander dropped into Times Square — all the words made sense, but I didn’t really know the landscape, the people or the buildings — it was all consistent and sensible, just slightly foreign. At that moment in the back of your mind you begin to panic just the tiniest bit; what do I not know, and how long have I not known it? A minor birdsong of doubt starts singing annoyingly. I’ve done professional research in this area! How could I NOT know this literature? That’s part of the problem: it’s a body of work, a “literature” that refers to itself, is contained within its conferences and scholarly papers. Knowing that is also part of the fun (and cause of panicky moments) in research studies. If it’s not something you continually monitor, it will change and grow larger and richer while you’re not looking. I no longer am stressed by the notion that there is a literature about executive functioning. Once I started reading, I also started recognizing names, concepts, universities, and even a paper or two on the topics that I could mentally link with. But there it was… just a few, bald, slightly embarrassing moments when I suddenly felt a bit like a fraud, as though all my training and background reading had failed me. Ah, but you’ve got to love moments like this, when you suddenly realize that the world is bigger, broader and much more interesting than you might have believed. And this is the time and point to start to do a search to learn something new. We live in a search-enabled world where you can self-educate on a moment’s notice. When I watch my kids struggling to learn something new, I see that the natural tendency is to shy away from the learning moments. Face it — learning is hard, painful and makes you feel dumb. You’ve got to believe that the time and effort invested in the abrasive parts of the learning process will pay off in the end. It’s absolutely essential that you know that fact, recognize feeling that way, and can recognize those moments of learning. When you feel dumb, awkward and slow is the way you know you’re learning. But you’ve got to believe that working through it can and will lead you to proficiency. It’s counterintuitive. And it might even be slightly pathological, but if you’re at all curious, you’ve learned to recognize the struggle and pain as a bona fide “good thing.” We’ve converted that pain from an irritant into a friend. And that’s probably the hardest lesson of all. Learning that the moment of discomfort leads to finding out something new about the world, and growing as a consequence. ... questions that seem straightforward enough, but ones to which you might not know the answers. 2. What was the original design for Mount Rushmore? Was it what we see today? How different is the original design? 4. People keep saying things, but I don't know what they mean! What does “one fell swoop mean”? 5. While we're on this topic, what does "heavens to murgatroyd" mean? And who says this anyway? 6. In the story of David and Goliath, David kills the giant with a single stone from his sling. Is this really possible? What kind of a slingshot could do that? These are especially difficult research questions (we'll have more of those soon enough), but they're examples of things that we see, hear-about, or come-across every day, and yet we don't really know quite what's going on here. This is one of the great features of having a search-engine on your phone--you can just ask and find out the answers quickly. Yes, I know I asked about the Papago, but remember this: Things Change Over Time. This is one of those things you have to remember, especially when looking for cultural identities or political bodies--states come and go, and cultures often get named one thing at one time (usually by whatever group is in power at the moment) and then renamed to something else later. In many parts of the world, Native peoples have been reclaiming their names as they regain power. This is what's going on with the people previously known as the Papago. 1. When I learned about the Papago tribe, I naturally assumed they were an Arizona tribe. But is that really true? Where are they located? Where are their historic tribal lands? and quickly learned from the Wikipedia page that what I grew up knowing as the Papago tribe has been renamed as the Tohono O’odham (pronounced TOHN-oh AUTH-um) people. In checking the reference links at the bottom of the article, I found a link to the official Tohono O'odham nation website. 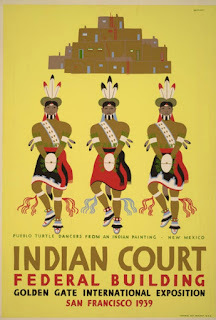 On that site, they describe their traditional lands as "...an enormous area of land in the southwest, extending South to Sonora, Mexico, north to Central Arizona (just north of Phoenix, Arizona), west to the Gulf of California, and east to the San Pedro River." found several maps, many of which have this very suspicious, very straight boundary that magically aligns with the edge of the US/Mexico border. That looks more like a regional homeland--no straight lines. 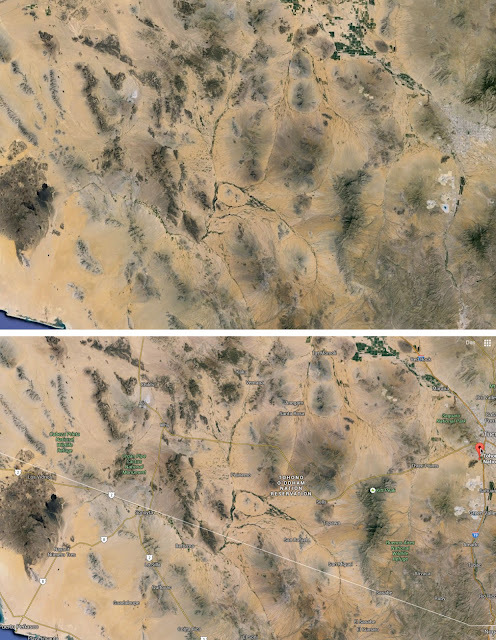 The political boundaries certainly aren't obvious is this side-by-side comparison of satellite views (from Google Earth, without boundaries, and with the roads and political boundaries overlay). This straight line is the artificial boundary that split the Tohono O'odham nation roughly in two. It was one of the results of the Gadsden Purchase of the territory from Mexico in 1854 that redrew the border right through O’odham territory. 2. Who is John P. Harrington, and what relationship does he have to the Papago? What is he best known for? leads to a wealth of resources. I could write an entire article about this fairly remarkable person, but the relevant resources here are the Wikipedia article, which summarizes him as "John Peabody Harrington (April 29, 1884 – October 21, 1961), an American linguist and ethnologist and a specialist in the native peoples of California. Harrington is noted for the massive volume of his documentary output, most of which has remained unpublished: the shelf space in the National Anthropological Archives dedicated to his work spans nearly seven hundred feet." One of the first links in the SERP leads to the Smithsonian Collection of Harrington's notes (the National Anthropological Archives are at the Smithsonian). The J. P. Harrington Collection of linguistic and cultural materials is one of the most remarkable holdings , including documentation on over 130 languages, many of which are now endangered or no longer actively spoken. (It's worth pointing out that the query [ Harrington Papago] works just as well). This leads to at entry at the Smithsonian about his research among the Papago/Tohono O'odham. This entry describes his trip in the spring of 1930, with assistant Henry Cervantes and Joe Moore as his auto mechanic, they began a trip following the route of the Anza expedition of 1775 -1776. They left from Salinas, California, going by way of Yuma, Tubac, and Nogales, Arizona, into to Sonora, Mexico. 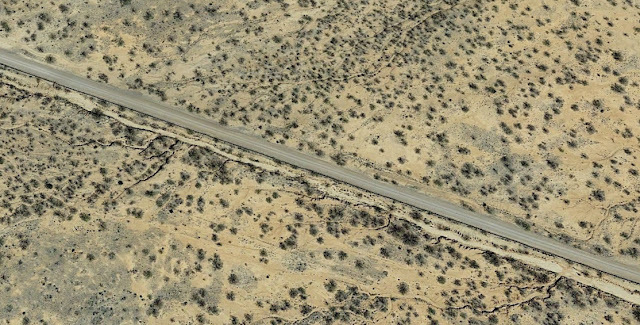 Harrington later reported that they had covered 872 miles of desert driving. In the course of this placename trip, Harrington minutely described each day's route and often illustrated it with a roughly sketched map. Included in the itinerary were stops at Casitas, Querobabi, Chupisonora, Opodepi, Camou, and Imuris--small towns along the way. Regular Reader Jon (the Unknown) found a wonderful obituary of Harrington. It includes such tidbits as "He never possessed a telephone at his home, and only a very few intimate friends knew his personal address. If he thought it were becoming too well known, he changed it..." And "He was one of the first anthropologists to realize the importance of coordinating other scientific disciplines with ethnology. He was deeply interested in the viewpoints of the various Indian tribes on natural history, and the majority of his field notes contain detailed sections on ethnogeography, ethnobotany, ethnozoology, ethnoconchology and the like. 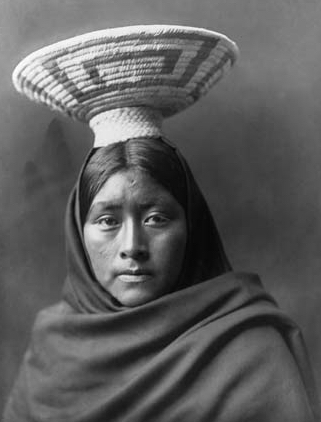 The “Ethnobotany of the Tewa Indians” (1916), a product of the 1910 field work, is a forgotten classic, far ahead of its time in its attention to native systems of classification." What an interesting, interesting guy. 3. In last week's Challenge we learned about the Pacifica statue. Can you find a connection between the original Pacifica statue and the Papago? As I read the previous web page, I just HAPPENED to notice that "...At a California Exposition on Treasure Island in June 1939, Harrington had occasion to record a Papago vocabulary from Manuel and Molly Williams of the Papago Reservation at Sells, Arizona..."
Why this query? Because it seems really unlikely to me that Papago would have somehow been connected to the statue, but it was very likely to be at the main event--which in this case was the California Exposition, or linked to its unusual place name, "Treasure Island." both are correct. 4. I'd like to learn more about their spoken language: Can you find a recording of someone speaking it? and found a good number of examples. The second hit is a nice extended sample of David Garcia (of Tohono.tv) speaking in Tohono O'odham. 1. Remember: Names change, and your search strategy has to take this into account. I have to admit that I knew "Papago" was an outdated term. But I didn't know what the new/correct name was. So I had to start with Papago, and then learn the correct name is Tohono O'odham. This becomes a real issue whenever you're trying to do research in history. Some places change names frequently (example: the city of Constantinople has been known by many names over the years, including Byzantium, Βυζάντιον, Konstantinoupolis, Κωνσταντινούπολις, and Instanbul). Remember this is also true for people and ideas. The political party definition of "Republican" has varied a great deal over time, and some political parties no longer exist (in the US, as is true elsewhere). When was the last time you spoke to someone who described themselves as a "Whig"? 2. Dig into the anomalies you find. The straight-edge tribal land boundary looked suspicious to me, which is why I decided to dig a little deeper. 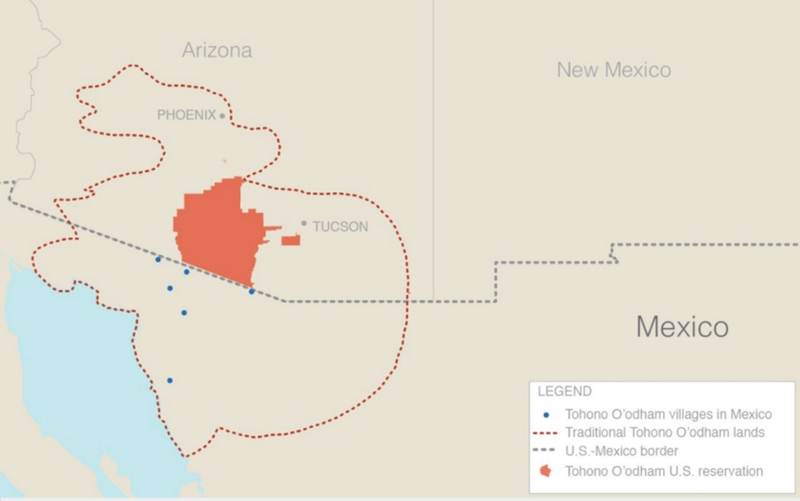 The fact that the Tohono O'odham people predate the US/Mexico border AND that the tribal land boundary happened to line up with the state boundary... well, that's too much coincidence. Sure enough, there's a good explanation for the anomaly. A. 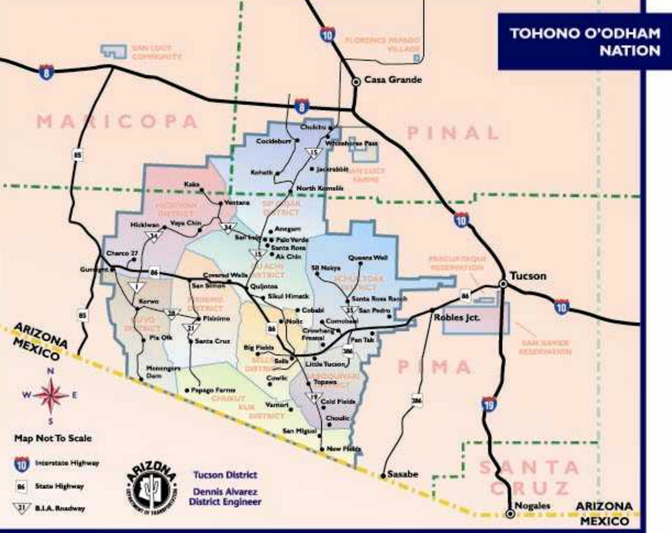 How many Tohono O'odham speakers are there? Who's making the estimates of the numbers? (Remember that a US Census won't count the folks in Mexico.) How do such population estimates get made? B. 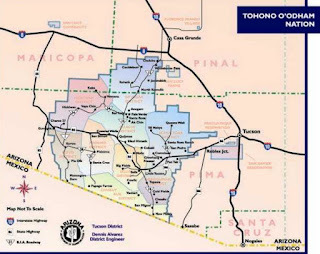 Are there other Tohono tribes? What are their names? Did they split off from the "main" tribe once, or why would there be other Tohono speakers? ... in Cottonwood, AZ, centered in the desert landscape of the Verde Valley, not far from the red rocks of Sedona and the mining ghost town of Jerome. In school, we'd visit local Native American sites like Tuzigoot (a pueblo on a hilltop) and Montezuma's Castle (a cliff dwelling site). As a result, I remember being fascinated by the Native culture in Arizona, from the Navajo in the northeast to the Pimas in the south. But one culture that really caught my attention, mostly because (at the time) it was tough to learn anything, was the Papago tribe way down in southern Arizona. This led me to do some research recently, and (as always) I was struck by what I found. There are lots of stories and insights here, and you could spend a lifetime on this topic. But for today, I have three Challenges to inspire a little bit of SearchResearch for you this week. As always, let us know what you find, and just as importantly, HOW you found it. What resources did you seek out? Which worked well (and which didn't). Answers and comments next week! Answer: When & whither these buildings? It's not often that as you walk the street, you run into a few buildings that seem as though they fell out of a Streamline Moderne fantasy. 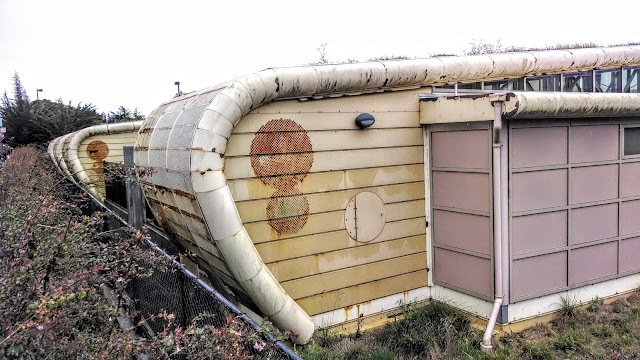 This was an architectural style that was from the 1930s, with swooping curves, long lines, and curved angles, a kind of Art Deco whimsy that influenced everything from building architecture to cars and toaster design. I've long been fascinated by how and why such things emerge onto our landscape, so I thought I'd look these particular pieces up..
1. When were these buildings constructed? Are they, in fact, from the era of Streamline Moderne? Since I knew they were at 37.728161, -122.451303, I first checked my map and found that these buildings are at the Orfalea Family Center on the campus of CCSF (City College of San Francisco). That's easy. But when were they built? which led to a bunch of deadends (information about the center, maps of their location, etc.). 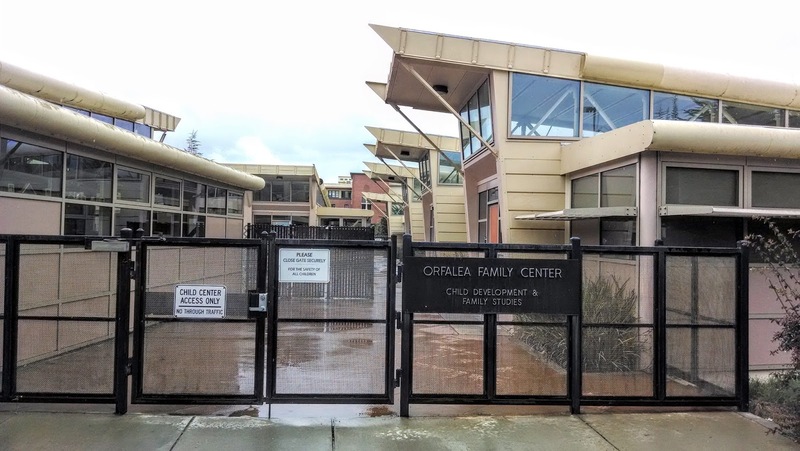 But it ALSO led me to an interesting article in The Guardsman about "Child Care Buildings Shouldn't Be Rusting" at the Orfalea Center. Before I read to much farther, I first did the obvious search about The Guardsman--what kind of publication is that? A couple clicks on their website led me to find out that it's the newspaper for CCSF. They the newspaper publication for City College of San Francisco. Since the college has over 100,000 students, they're a pretty good size newspaper! In that article, there's a line about the buildings being "less than six years old..." THAT surprised me. 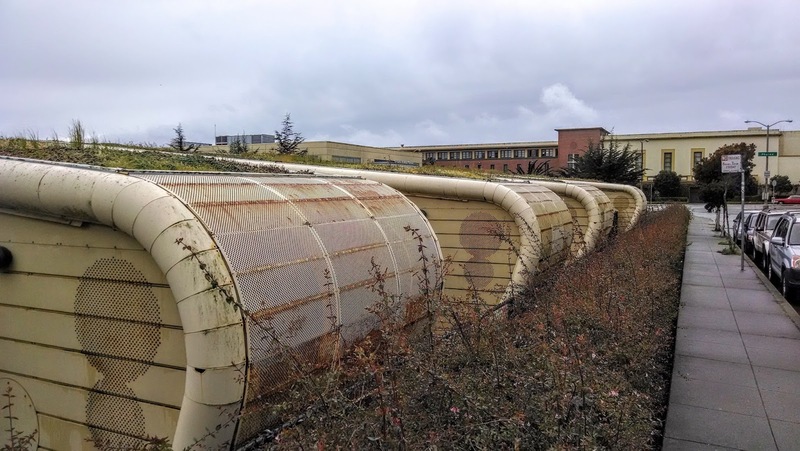 I thought they were Moderne, and given how rusty and generally beat-up they look, it didn't seem possible that they could be from 2008, yet that's what the article claimed. 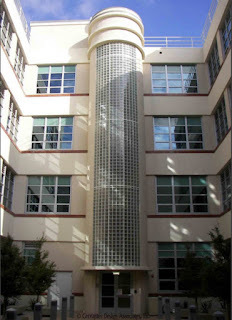 Following a different strategy, Regular Reader Judith did a search for [ CCSF Streamline Moderne ] and found that there IS a building on campus in that style (Mission Campus’s 110 Bartlett Building, was originally the Samuel Gompers Trade School, constructed in 1937)... That's excellent, but it's just not these buildings. 2. What's the controversy around these buildings? You can get a sense for the controversy from the article above. Buildings constructed in 2008 shouldn't be falling apart. As a consequence, there's an active investigation going on (still, apparently) about who's at fault. The architects? The builders? What's going on? The Guardsman article mentions a company, Project Frog, that Regular Reader Remijj looked up with the query, [ Project Frog ], leading to their home page, and an article in Forbes that tells us they started as a business in 2006, which would have made this one of their very first projects. Project Frog specializes in "snap together" or Ikea-style "flat pack" buildings that are built elsewhere, then "snapped together" on the project site. That gives them a construction advantage, but something seems to have gone wrong in the Orfalea Center. To see how bad it's gotten, I just did a quick query [ Project Frog lawsuit CCSF ], hoping I'd find something, and I did. In their May 14, 2015 edition, The Guardsman reports on the lawsuit that's been filed against the Indiana-based construction contractors Hunt Construction Group, and will go to trial, in June 2016.
because I'd never heard of such a name before, and was just curious. I discovered that Paul Orfalea (Arabic: بول أورفاليا‎), was nicknamed "Kinko" because of his curly red hair, and founded the copy-chain Kinko's when he was a student at UC Santa Barbara. Ah.. THAT's where the money comes from! 3. As I kept walking in this neighborhood, near this building cluster I accidentally discovered a mural by a very famous muralist. (Seeing it was one of those shocking moments: That's HERE?? You're kidding!) What is the name of the nearby mural? Who painted it? And how far is it from these buildings? 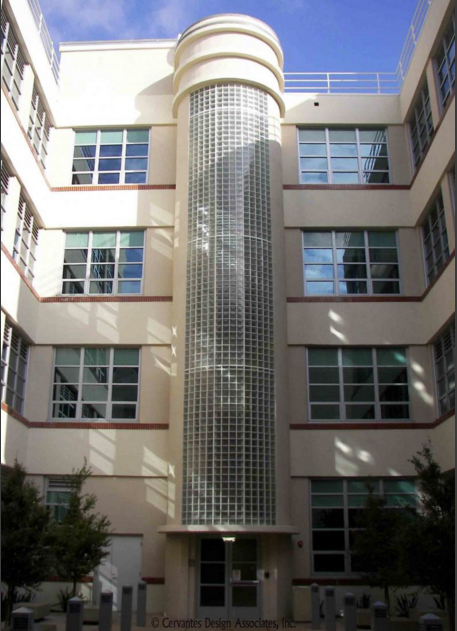 As we saw above, the book about CCSF tells us about a mural of Peter VandenBerge that's at the center. Fascinating, as I didn't know it was there. And the first hit is for the Pan American Unity Mural by Diego Rivera. The web page is by the college, so it's probably reliable. The mural is at 50 Phelan Avenue, and housed in the Rivera Theatre on campus. Looking at the map, you can see it's about 200 feet from the Child Center to the theatre. 4. Extra credit: If you figure out the mural, you'll find this one easy... Very near the mural is a sculpture that is a reduction (in scale) of a VERY large sculpture that once appeared on Treasure Island. What's the name of that sculpture (and hence, of the smaller version) near the mural? quickly confirms that Pacifica is a statue created by Ralph Stackpole for the 1939–1940 Golden Gate International Exposition held on Treasure Island in the San Francisco Bay. It was Stackpole's largest sculpture. At 81 feet (25 m), it towered over the entrance to the Cavalcade of the Golden West in the Court of Pacifica. Since this version is in a campus garden, and stands only 15 feet high, it's clearly a replica. In case you ever visit, the campus is fairly full of interesting sculpture. Here's a guide to CCSF statuary, including Pacifica. 1. Use what you've got. In this case, I gave you the lat/long, and you could read the name of the Orfalea Family Center in the 3rd image, so finding the location (and then verifying with StreetView) was pretty easy. Then, with an unusual name like "Orfalea" as a search term, the rest was pretty simple. Finding the college newspaper (the Guardsman) was a stroke of luck, although whenever you're searching for campus news, most colleges have some kind of online presence, and that's a useful thing. 2. Check other resources. 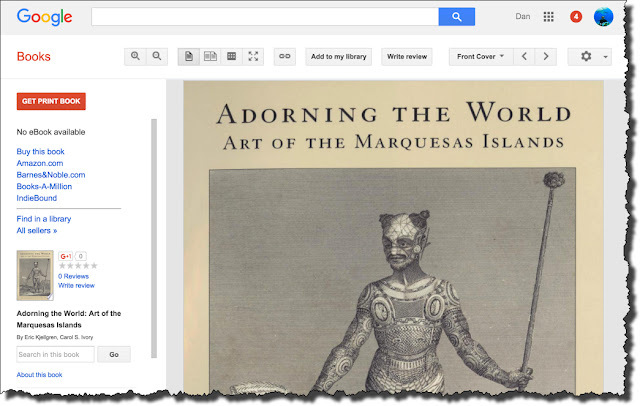 Paola R was smart to look in Google Books and found a picture of the center before it turned somewhat crufty. Likewise, checking out YouTube with the query [ Diego Rivera mural CCSF ] leads to a couple of interesting videos, including this fascinating cellphone video panning across the mural. It gives a great sense for how big, colorful, and beautiful it is. 3. Try linking concepts together to get exactly what you seek. 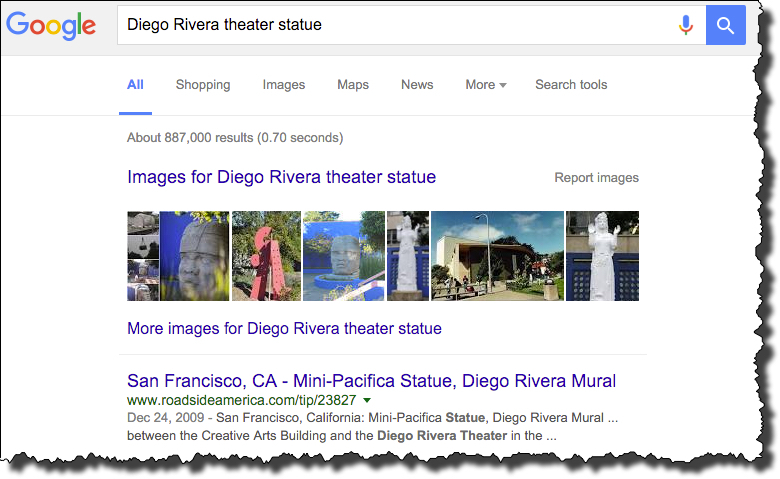 In the query [ Diego Rivera theatre statue ], I put together two distinctive concepts (the mural and the statue) that I figured would get me to the statue of Pacific near the mural. This works because people often write about things-near-other-things: If you're going to write about the mural, you might want to mention that gorgeous statue out in the courtyard. Stay curious my friends, and when you run across some beautiful buildings that seem historic, but are in disrepair, take a second to search it out--there could be a hidden scandal there! 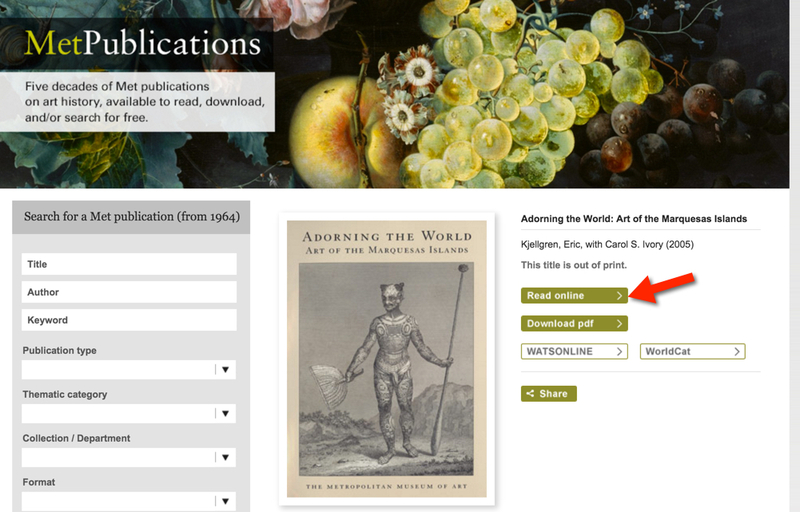 Did you know that you can often find online PDF versions of books for free? These same folks previously offered 397 complete books free, including American Impressionism and Realism: The Painting of Modern Life, 1885–1915; Leonardo da Vinci: Anatomical Drawings from the Royal Library; and Wisdom Embodied: Chinese Buddhist and Daoist Sculpture in The Metropolitan Museum of Art. Since then they've grown the online collection to no fewer than 448 art catalogs and other books besides. Those are all available for free, along with the 400,000 free art images the museum put online last year. It's worth keeping your eyes open, just to keep track of what's available online. Search Challenge (1/13/16): When & whither these buildings? ... I was surprised to find some really interesting buildings. That, in itself, isn't odd--San Francisco is full of interesting and odd buildings--but this particular cluster of buildings looked to be some kind of small cluster of Streamline Moderne buildings. 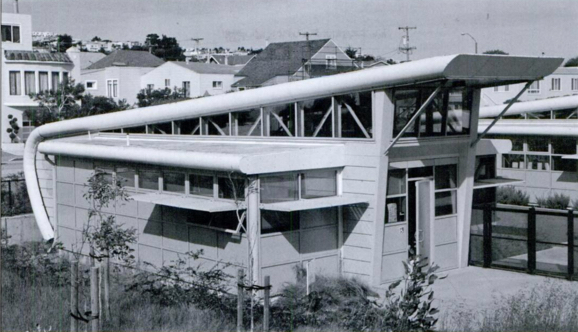 Did I find a previously unknown example of this particular style of architecture that was popular in the 1930s? Here are the pictures I took. What would you think when you walked down the street past these? Would they attract your eye the way they did mine? Naturally, when I got home, I did a little SearchResearch, and was really surprised by what I found! 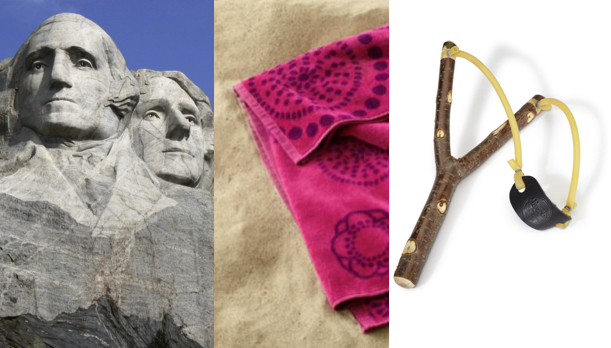 This Challenge is a study in linking data from the cues you can get from the images, to the clues for the next Research Challenge in the chain of questions. I hope you enjoy researching this as much as I did walking around and discovering beautiful things in the city. Let us know your answers in the comments below--and when you write up your solution, be sure to tell us HOW you got from step-to-step. ... but rather, a quick reminder for everyone who enjoys reading SearchResearch that you can get this delivered to you via email by joining the Wednesday SearchResearch Challenge group. Here's the link to join the SearchResearch Group. Click on the blue "Apply" button to join the group. When you join, you'll get around 2 emails / week (one Challenge, one Answer), and maybe one or two more each year. I'll be taking this week off (more traveling), and we'll get back to regular business NEXT week (Jan 11, 2016). ...you'd think we'd be done with him. But no--he's far too interesting a person. He is, without doubt, the most interesting person I've ever heard of... if half of his stories are true, he led an unparalleled life. The thing that struck me this week was how much time he spent diving in the Caribbean. Yeah. 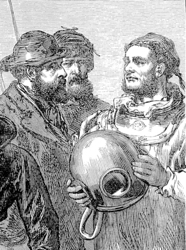 This was the middle of the 19th century, and he's diving in a hard hat, pulling up corals and "curiosities" to sell in New York and the big cities of the east coast. This proved to be very lucrative, and set the stage for much of the adventures that followed. 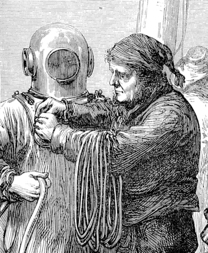 1873 diving dress. Copper hard hat. This was the day of hard hat diving, enclosed in a heavy canvas suit, with heavy boots to hold you underwater. You'd put on the suit (or "dress" as it was called), and then buckle on the hard hat, trusting that the pumper above would keep manually pumping air down to you as you walked along the ocean floor. What sights did he see as one of the first divers in the Caribbean? How wonderful was that? Before putting on the hard hat.